This article on the 7th (Queen’s Own) Hussars will provide you with an overview of the Regiment’s service during the First World War. In addition, it will help you to research a soldier who served with the Regiment during the war. Location in August 1914: The 7th (Queen’s Own) Hussars was stationed at Bangalore (Karnataka, India) having arrived there on 4 November 1911. The Regiment had landed in India from England on 2 November 1911. When Britain declared war on Germany on 4 August 1914, the 7th (Queen’s Own) Hussars was stationed at Bangalore, India. By 1916, the Regiment was serving as part of the 4th (Meerut) Cavalry Brigade. On the 4 October 1917, the 7th Hussars received orders to mobilize for service in Mesopotamia and moved to Karachi (Sindh, Pakistan) on 18 November 1917. The Regiment left India in three ships, all of which safely arrived at Basra, Mesopotamia (Iraq) the same month. On arrival in Mesopotamia, the 7th Hussars joined the 11th Indian Cavalry Brigade in which it served until December 1918 when the Regiment joined the 3rd Indian Cavalry Brigade. There are two war diaries which cover the 7th Hussars’ service in the Mesopotamia Campaign between October 1917 and January 1919. These two documents give the location of the 7th Hussars and record its day-to-day activities. If you are researching a soldier who served in the Regiment these two documents are crucial. On 26 March 1918, the Regiment took part in a battle which became known as the Action of Khan Baghdadi (26-27 March 1918). There is a very detailed account in the war diary which also names the casualties. The 7th Hussars suffered eight wounded during the battle one of whom 3959 Private Walter Robert Elson died of his wounds on 27 March 1918. The 7th (Queen’s Own) Hussars took 810 prisoners. The 7th (Queen’s Own) Hussars also took part in the Battle of Sharqat (23-30 October 1918) which would lead to a decisive victory over Turkish forces just prior to the Armistice. Again, the war diary provides a good deal of information in which the regiment suffered over 80 casualties. The 7th Hussars moved to Baghdad after the war and was still there in January 1919 when the war diary finishes. 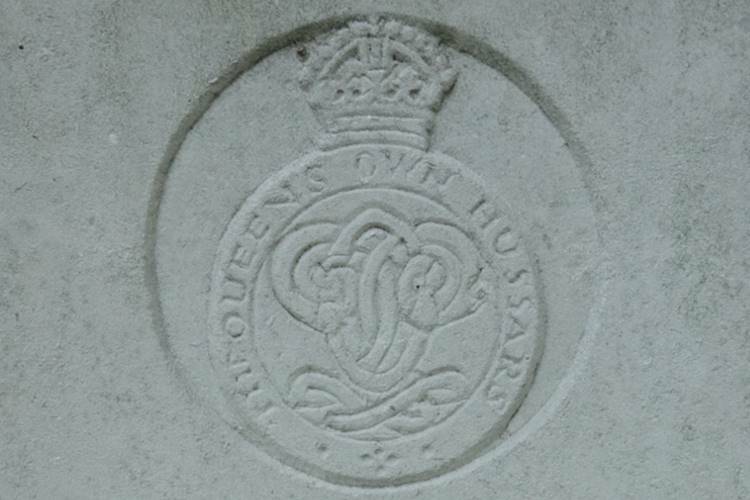 The badge of the 7th (Queen’s Own) Hussars consisted of the monogram QO surrounded by the words “The Queen’s Own Hussars” and surmounted by a crown. This rather worn example is from the headstone of 5238 Private James Henry Ward who died on 25 January 1920 and was buried in the Edmonton Cemetery, Middlesex. 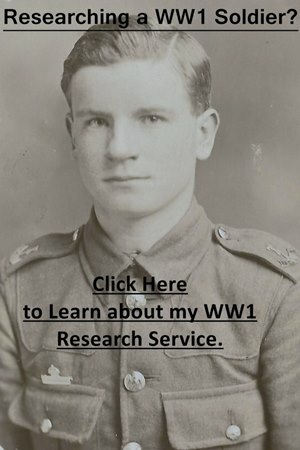 If you are researching either an officer or other rank who served with the 7th (Queen’s Own) Hussars during the First World War start with my Guides to Researching WW1 Soldiers. The most important records to start with are those concerning finding service and medal records. I also have a page on British Army abbreviations and acronyms as you’ll encounter a lot of jargon. The 7th (Queen’s Own) Hussars is difficult to research for the years it served in India as no war diary was kept. However, a diary was kept between October 1917 and January 1919 and should be downloaded if you want to find out the daily activities of the Regiment. I have discussed the war diaries below. Officers: British cavalry officers are always good candidates to research and you will usually be able to find out a lot of information about them. You should start off by looking for a service record at the National Archives (I offer a copying service) though if an officer served past April 1922 then their record should still be with the Ministry of Defence. The war diary recorded the names of officers and if you are looking for a casualty I’d recommend looking at contemporary newspapers for reports. Other Ranks: First look for service and medal records (available on Ancestry). The service records of soldiers who served with the 7th Hussars past January 1921 should still be held by the MOD. I have written a guide on how to order them on my other website Researching WW2: Ordering a Service Record from the MOD. If a service record hasn’t survived and a regimental number is known you should be able to work out an approximate enlistment date. Both war diaries of the 7th (Queen’s Own) Hussars have been digitized by the National Archives and you can download them for a small fee by clicking on the blue links below. I have transcribed a few entries at the bottom of the page. Notes: A good war diary. There are a number of interesting entries (I have transcribed a couple below) regarding the attempts of the 7th Hussars to stop thieves. Appendices include: a very detailed account of the role of the 7th Hussars during the Action of Khan which also includes a map of the Brigade’s march on 26 March 1918 ; list of British officers serving with the 7th Hussars in March, April and May 1918 ; description of the route from Khan Baghdadi to Anah; sketch of the Regiments “dispositions during operations Oct 26-29 inclusive”. Notes: A short war diary of only 10 pages with a handful of entries. Unfortunately, there is no stand-alone regimental history for the 7th Hussars covering its service in the First World War. However, there is a book which I haven’t seen which covers the period between 1911-1937: The Years Between. The Story of the 7th Queen’s Own Hussars, 1911-1937. Compiled by Major-Gen. Roger Evans. I’d recommend looking at a copy of A History of the British Cavalry: Volume 6: Mesopotamia by The Marquess of Anglesey. This book is very readable and will explain the role of British cavalry in Mesopotamia, how they operated and the problems they faced. It’s the best book to add context when researching a cavalryman who served in the campaign. Are you researching a soldier who served in the 7th (Queen’s Own) Hussars or any other unit during the First World War? If you are, click on the photograph below to learn more about the research service I offer. 4 October 1917 – Meerut – 2.30am – The Regiment was ordered to mobilize for service in Mesopotamia and as reported to Headquarters as fit for service the same night. C Squadron was ordered to proceed to Arrah for duty in aid of the Civil Power. 9 October 1917 – Meerut – A revised war establishment was received from army headquarters. Forty horses were transferred from the Depot 14th Hussars, Meerut to complete establishment. 16 October 1917 – Meerut – The Regiment (less “C” Squadron) was inoculated with T.A.B. 18 October 1917 – Meerut – Sixty men were posted from the Combined Cavalry Depot, Meerut to complete establishment. 2nd Lieutenant A. E. Stevens rejoined from duty in Mesopotamia as assistant Provost Marshal to take up appointment of Adjutant. 6 December 1917 – Nahr Umr – The Regiment accompanied by “W” Battery Royal Horse Artillery, “F” Ammunition Column, 152 Combined Cavalry Field Ambulance and 34 Mule Corps (Hussars Echelon) left Gurmat Ali and marched to Nahr Umr a distance of 14 miles. Arrangements for watering the horses at the marching post were not good. Horses had to be watered from buckets. A very difficult proceeding when the tide is low. Trenches had been dug to catch water as high tide but these were quickly emptied. 14 December 1917 – Abu Sidrah – During the night 13/14 several kits were looted from “W” Battery by Arabs from a neighbouring village. On the following morning an Arab village held responsible for the theft was searched and a certain amount of government property in the shape of blankets (etc) was found, five rifles and 3 hostages were taken. The rifles, hostages and kit were taken on to Amara and handed over to the political authorities. 16 December 1917 – Amara – On the night of the 15/16 the regiment were unfortunate to lose 9 rifles and one revolver stolen from two tents presumably by Arabs. Up to date the rifles had according to regimental orders been buried by sections within their [?] tents. On the night in question and indeed on 2 or 3 previous nights as the evidence taken showed, the rifles of one squadron due to some misunderstanding of orders has not been buried. The rifles taken were 9 out of the 13 belonging to one section and fastenings by ropes between the centre and rear poles of the tent. The revolver was the property of the squadron sergeant major of the same squadron and was taken from underneath his pillow while he was asleep. After this orders were again issued that all arms and ammunition were to be buried.